This is a solid Finnish Swashbuckler with good production values and great sword fights. Kalervo Nissilä is one expressive actor. Thanks to Boris for finding the title. 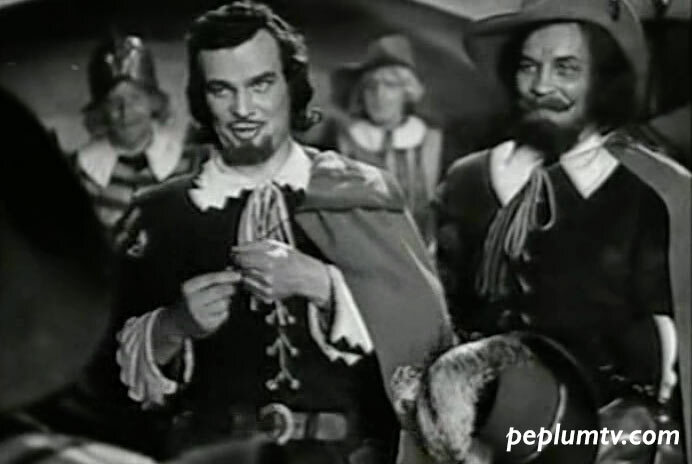 Searching IMNb for the character Gustav II Adolf in films, I found a film called "En Aventyrare" (Adventurer) a Swedish Film from 1942 with Sture Lagerwall. Couldn't find any photos from the film.. only Film Posters on Google. Looks close to what you are looking for. I did find that title during my search but the mystery film looks to be more late 1940s - early 1950s, not early 1940s. Also I can't find Sture Lagerwall in the film but he might be in heavy makeup (fake nose and all). The inter-title is in Finnish and I used Google translate via Finnish > English and it translated. I don't know if it's a Finnish version of a Swedish film or a Finnish film. I need a screenshot from "En Aventyrare" to compare. Yes, that's it! Thanks Boris.